March 4, 2011-By John Blair, valleywatch.net editor. Big Rivers Electric Company's Coleman power plant stands in contrast to the eerie but captivating shades of blue caused by SO2 being emitted by that plant and others in the region. Tell City, IN is across the Ohio River from the plant in this picture © 2011 John Blair. Sulfur dioxide is emitted from coal fired power plants in massive quantities. 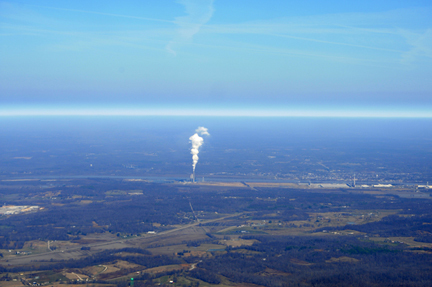 In the Indiana, Kentucky region around Evansville, the volume of sulfur dioxide streaming from the regions stacks is more than a half million tons per year. When the SO2 is emitted and combines with an Oxygen molecule or O2, it becomes SO4 or a sulfate particle. If moisture is present SO2 will combine with water to become H2SO4 or Sulfuric Acid. Sulfuric Acid is the principal component of Acid Rain. In the dry form of sulfate, it is mostly what is known as a fine particle. Fine particles are responsible for numerous human health problems, including asthma attacks, heart attacks, chronic lung disease, stroke and even cancer. EPA has set standards for public health for fine particles and most of the monitors in the region indicate that we would be in violation of of the standard being proposed by EPA’s Clean Air Scientific Advisory Committee of 14µg/m3. A word about both water vapor and sulfate particles. Both of these attract various other pollutants from agricultural dust to other power plant pollutants that remain as fine particles and are easily breathed in by human and animals. This entry was posted in Uncategorized and tagged air pollution, Coal, fine particles, Indiana, Kentucky, sulfate. Bookmark the permalink.